To celebrate the upcoming release of my third novel, Driving in Neutral—a love story about claustrophobia—I am running the 75 Days of Phobia series. Today, Day 21, features my guest Anna Campbell. In the spirit of her courageous Regency era heroines, today Anna faces up to the fear that dares not speak its name, although it has the power to turn her blood to ice. When the gorgeous Sandra Antonelli (Aww, thank you, AC!) asked me to reveal my deepest phobia, the first thing I thought about was clowns. This is such a widely held fear that it even has an official name – coulrophobia (see Lisa Barry’s Day 7 post), which, on this list of phobias (http://phobialist.com/) comes right after consecotaleophobia, the fear of chopsticks. Who knew such a thing existed? Although given how often rice and indelible gloop have glumped from chopsticks onto my heaving bosom, perhaps it makes sense. But even worse than my clown phobia is the nightmare I’m sharing with you today. My name is Anna Campbell and I suffer from…nillustoreadusphobia. It’s the fear of a horrible condition called nillustoreadus that strikes when a person has a burning desire to read, she checks her towering To Be Read pile and she still can’t find anything she really feels like reading. And everyone needs something to read! It’s a basic human right. Well, that’s not exactly true. There is a book to read. Obviously. 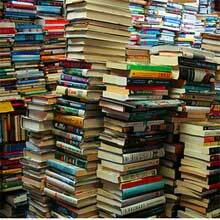 In fact, if your TBR pile is like mine, there are LOTS of books to read. But nothing that quite strikes the right note. Leaving you prey to NTR and enduring the torments of the unbooked. All those pretty covers. All those come-and-get-me titles. All those beautiful white pages littered with little black marks. And none of them can save you. In a desperate attempt to avoid the onset of this phobia, the sufferer is prone to mad behavior involving reckless acts with a credit card. The nillustoreadusphobic dashes madly to her nearest dealer…uh, bookshop and purchases large numbers of new books in the hope that she can stave off this horrible condition. Sometimes this strategy works. Sometimes, tragically, it doesn’t. Am I alone in suffering these vile tortures? Please, let me know that there are others out there who know this pain! Perhaps we can form a support group. Or at the least organise a field trip to the nearest library! 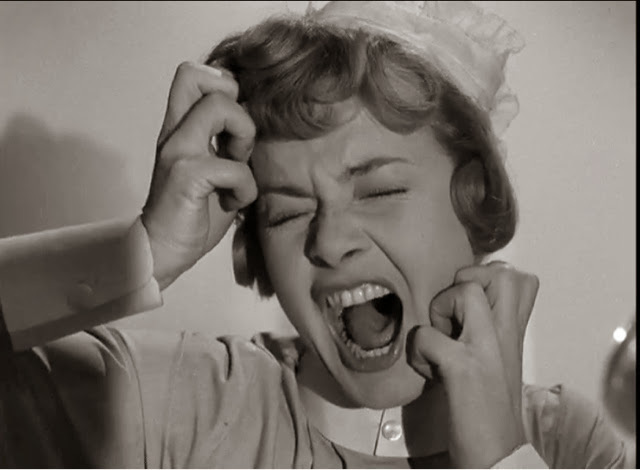 By the way, my physician’s advice to anyone suffering NTR phobia this September is to get to your nearest dealer…uh, bookseller and pick up a copy of WHAT A DUKE DARES, my latest book. It will soothe those pangs of NTR like a clown soothes… AAAARRRGGGGGHHHHH! Thanks for having me as your guest, Sandra! So nice to know I’m not alone in my phobia! Look forward to reading the rest of the phobias you’re going to pheature! It was my honour and pleasure to have you, Anna. You are most gracious and very supportive. I thank you from the bottom of my heart. I so agree with you, Anna. Too many books too little time, I blame my Kindle! Did we give more weight to books when only in print? I would always finish a story, even if it wasn’t a favorite. But now, it has to grab me fast, with an original slant, if it’s too much like a number of other stories, I put it down. Maggi, I haven’t moved to an e-reader yet and still I feel like that. I usually give a book a good go – about 100 pages – before I give up on it. But if I’m not grabbed by that stage, I’ll put it down. Too many other good books to read and just not enough time. Jennifer, welcome to the NTR Support group. Looks like we’re going to need a bigger room! Interesting comment about flicking through stuff on the e-reader. I saw a really interesting post a few weeks ago about how reading habits have changed and that digital reading favors simpler, shorter stories just because you can flick through them and still get the gist whereas something longer and meatier requires more concentration. I think it would be sad if that was the case! I love sinking my teeth into a really well-imagined world that sweeps me away for a couple of hours to a completely different place. Thank you for saying such lovely things about the books. Not long now till Duke! And I think we need another meeting room for the clown phobics! Ha ha, Christine! The first step toward conquering a phobia is to face it! So glad I’ve brought you to that point! By the way, that was a very poetic take on NTR! Mary, well, there’s a name for it NOW! LOL! Thanks for swinging by – I think Sandra’s phobias blogs have been so much fun. I was going to do something serious (actually I do find clowns really creepy, that’s not a joke!) but this struck me as something a few of us might relate to! Actually I think you’re right about the time pressure. It’s a bit like that episode of Seinfeld about the sponges – is this book read-worthy! Clowns. Who the hell decided they were funny? Wow, so glad I’m not alone! 🙂 Will take up your suggested remedy immediately and hope I don’t relapse before your next book! Well Anna – thanks for coming out of the closet with this one! My way of rationalizing this Phobia is that with my time so limited, am I afraid that the hours I might spend on **next chosen book** may be frittered away if the story does not come up to par? As many are bought on reviews or blurbs. Just a thought. But still a quandary.